The Leadership Team serves the purpose of representing the entire group in making logistical types of decisions. When making decisions in Y2Y about what projects and initiatives to take on it is unrealistic to get all 70 members together to vote on issues such whether to support legislation or to pick a new logo. The Leadership Team serves the purpose of representing the entire group in making those types of decisions. The Leadership Team consists of high school students drawn from the Monday Night Team and all members have been in Youth to Youth for at least 3 full years. The team meets a couple times a month outside of their regular team meetings. Generally they meet on Mondays from 6:30 – 7:15 pm. New team members are selected by the current members of the Leadership Team. Team members remain on the Monday Night Team while serving on the Leadership Team. 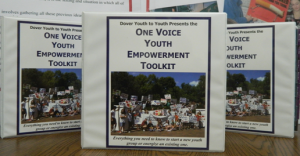 Since most of these members have been in Y2Y since the 6th grade, they have a high level of experience in youth advocacy, including highly developed presentation and media skills. These students act as “anchors” in major presentations. They are leaders of the presentation teams and are responsible to help others learn the parts and to monitor a presentation as it is being given. Anchors are expected to spot something out of order or information that was missed and to step in and fix it as needed. They make decisions on what legislation to submit, support or ignore. They often are part of testifying to the legislature or City Council. Team members act as project leaders in major demonstrations or other major projects. They play key roles helping to supervise the summer Advocacy Camp and they are expected to attend the meetings of other teams on occasion to assist younger Y2Y members. They participate in media and are often asked to determine if a script or idea is ready to be recorded or if a recorded PSA is acceptable.